I grew up in rural north Cornwall, on the outskirts of a tiny village, with no pub, shop or post office, but a medieval church, a village green, and an abundance of cows, foxes and old people. From time to time, we would make an expedition to what passed for civilisation, so as to purchase shoes, duck food and other necessities. Our destination of choice was, occasionally, Launceston (pronounced ‘Lahnsun’), where I could get my hair cut in a place called Tangles for £4.50, my mother could buy some curtain fabric she didn’t need, and my father could take us all to the Mad Hatter’s café on Church Street for coffee when being in a conurbation of more than twenty houses got too overwhelming. 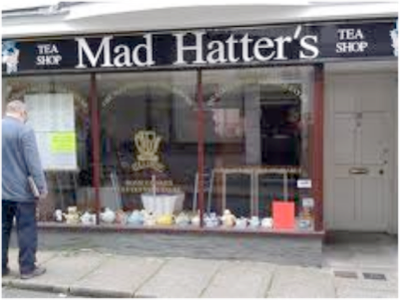 I mention this because the Mad Hatter’s café (and the cake menu in particular) has passed into family folklore. The café itself is still there, complete with a hundred-strong teapot collection and Alice in Wonderland décor, but it has changed hands and sadly no longer retains its original menu. In the early ’nineties, this included a bewildering list of homemade cakes, all displayed temptingly under glass. If a customer found himself unable (me) or unwilling (Father) to choose just one kind of cake, he could order Indecisive Cake, which consisted of a trinity of slightly smaller pieces of cake (unless they were ‘getting towards the end’ of a cake, in which you got extra), chosen at random by the proprietor. I don’t think we ever ordered anything else. We moved to Cornwall2 just as the village church was entering what Anglicans charmingly refers to as an interregnum i.e. a compulsory pause between vicars.3, This meant that the parish passed into a sort of Indecisive Cake period of its own: instead of one vicar conducting all the services, we had several celebrants of various flavours, chosen at random by a higher power4. They were mostly aged, well-meaning retired vicars who could be relied upon to read the notices clearly and stay calm in the face of my father playing the tune for ‘Onward Christian Soldiers’ as we all opened our books to sing ‘Love Divine’ or similar. Two stand out in my memory at either end of the quality spectrum, rather like the angel/devil figures so often used in cartoons to illustrate moral conflict. On the angel shoulder was the late lamented Peter Coster; on the other, a man who we always referred to as the Hobgoblin5. Peter Coster was a lay reader of great gentleness and charm. He gave thoughtful, well-constructed sermons about whatever topic had taken his attention that week, and kept to a length and subject appropriate to a tiny congregation of elderly villagers. On the other shoulder, the Hobgoblin was somewhat stronger meat. I think the period I’m talking about here pre-dated Eddie Izzard’s ‘cake or death’ routine, but either way the Hobgoblin did not conform to the notion that you can’t have strong points of view in the Church of England. I don’t think I ever knew his real name, and in any case the Hobgoblin suited him much better6. Top hat notwithstanding, he looked remarkably like the Hobgoblin from Finn Family Moomintroll, with a vigorous beard and dark, menacing eyebrows. The original Swedish title of Finn Family Moomintroll is Trollkarlens Hatt7. Trollkarlen (even less recognisable in the Finnish, Taikuri) means ‘Magician’ and the Swedish title (literally ‘The Magician’s Hat’) refers to the Hobgoblin’s search for his magical, transformative top hat. Our Hobgoblin (who may or may not have flown through the air on a panther and may or may not have mislaid the King’s Ruby) had spent some considerable time in the Holy Land, and treated us to wild, distinctly-made-up-sounding declarations, declaimed in Hebrew (?) with outstretched arms and blazing eyes8. Presumably some of these were blessings and Biblical quotations, but how were we to know? He could just as easily have been translating the parish magazine on the spot. One might modify Freddy’s sentiment accordingly: ‘people should definitely not quote the Scriptures at one in a language one does not understand’. I don’t know how to apply the Indecisive Cake metaphor to this situation. Should one assume that, were Rex ordering vicar-cake, he would be content to dine on Mad Ranty Sponge every Sunday? Or is it more likely that, just as a broken clock is right twice a day, the random vicar-selector was bound to match up with the theological preferences of one of the shuffled inhabitants of the village sooner or later? I’m talking here about style rather than content – I don’t think for a moment that our tiny hamlet was a hotbed of Jew-hating fornicators (although there may have been one or two), but rather that perhaps the Hobgoblin’s fire-and-brimstone style is an example of what the passage from Revelation is driving at: being cold or hot, rather than lukewarm. I take this to mean, in some sense, having the courage of one’s convictions to either be what one is, or to choose what one will be, however distasteful this might appear to others. The Hobgoblin, regardless of what he actually said, did at least fit one set of ideas about what religion ought to be: passionate, taken seriously, and declaimed without shame or self-consciousness. I said earlier that I didn’t feel his Sodom and Gomorrah sermons had much overlap with the needs of his parishioners, but perhaps that isn’t right. Perhaps from time to time, one feels the need for someone who knows whether they are cold or hot. Cold or hot, I would thou wert one or the other. 1 Muriel Spark, The Mandelbaum Gate (London: The Reprint Society, 1965), page 16. Biblical Quotation from the King James translation, Book of Revelation, chapter 3. As I noted in a previous post (see ‘Why Don’t You Do Right?’), one should always give one’s sources. 3 I don’t know why the church uses this word. Since it refers to a sort of lull, between the acts rather than between kings (and one rarely meets a kingly vicar), ‘intermission’ might be a better term. 4 The Rural Dean, according to Father, although I think it’s clear he was merely the Lord’s instrument (as are we all). 5 Discussion with Father reveals that he always assumed Peter spelled his surname ‘Coster’ as in costermonger, and I always assumed ‘Costa’. I have used ‘Coster’ here as a. Father is more likely to have seen it written down and b. this makes the whole name closer to Paternoster, which pleases me greatly. 7 Tove Jansson, while Finnish, wrote her books in Swedish.